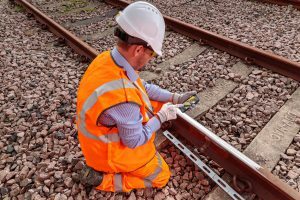 Work being performed to restore rail service along 95 miles of track between Ashland and Weed, Oregon. 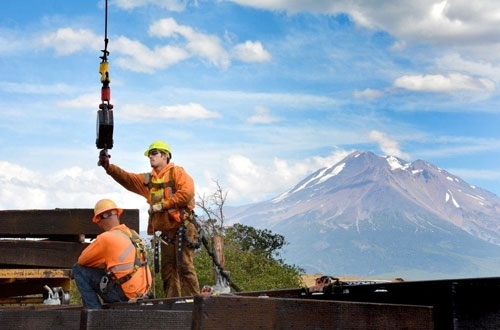 Major repairs to restore the Siskiyou Rail Line in southern Oregon have been completed and stakeholders held a ceremony, Nov. 10, marking the return of freight service, which was halted along 95 miles between Ashland and Weed, Ore., in 2007. The $13-million Siskiyou Summit Railroad Revitalization project repaired and revitalized a 65-mile section of the 296-mile stretch of the Central Oregon and Pacific Railroad, including rail, tunnels, ties and bridges, as well as upgrading its freight capacity to handle the 286,000-pound industry standard for rail cars. Currently, timber companies and other manufacturers must ship by freight rail north to Eugene to meet the Union Pacific line into the Southwest. In 2012, a $7-million Transportation Investment Generating Economic Recovery (TIGER) grant was awarded to the Oregon Department of Transportation and California’s Siskiyou County for the Siskiyou Summit Railroad Revitalization project. CORP provided a 25 percent match. Additional funding came from Douglas and Jackson counties. 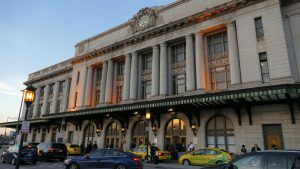 Seil said each train will be loaded to 12 to 14 cars in length. Repair work started last spring. 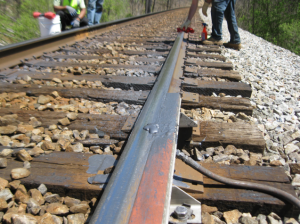 Crews replaced 42,000 new ties, some dating back to the late 1940s, as well as 50,000 linear feet of new rail. More than 20 trestles were rehabilitated with new timbers and walkways. Tunnel 14, located south of Ashland, was in such bad shape that some of its 175 timber supports were collapsing. Tunnel repairs included spraying the walls with shotcrete and adding new rail, ties and ballast. 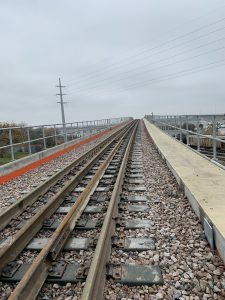 “Anytime a line has been shut down for several years, there are items that need to be accomplished, such as removing weeds and trees that have grown up near the tracks, crossings that aren’t working properly and an accumulation of debris that’s fallen near the tracks,” said Seil. 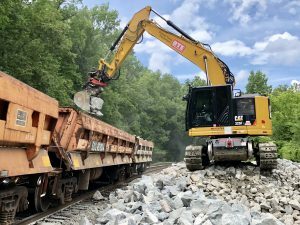 A second, $5.7-million project, funded with $4.5 million through the ConnectOregon IV program, improved the clearances of tunnels and other rail infrastructure between Douglas and Jackson counties. It will open access to the Rogue Valley with modern, high-capacity rail car equipment. “The project will allow taller, high-capacity boxcars to be used on the Siskiyou Line,” said Bob Ragon, spokesman for Coos-Siskiyou Shippers Coalition “These rail line improvements help give local companies a competitive edge, protecting jobs and enhancing industrial growth in northern California and southern Oregon,” said Ragon.